Today is the day I take another step into my life – deeper into the sea of dreams, desires and journey into the next adventure. 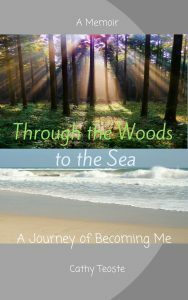 My new book, Through the Woods to the Sea: A Journey of Becoming Me is now available. 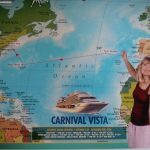 Sharing my story, my life with the world is scary exciting! 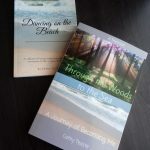 Writing being an author has been a long buried dream of mine since I was a little girl, but like I pushed aside my love of the ocean, I buried that dream because I was told it was impractical and unrealistic. It took fifty years of my life to dig it up and resurrect it. It took almost another ten to write it and find the courage and confidence to rewrite, edit, and publish it. After writing the rough draft, fear took hold. A friend suggested I test the waters and write a short book on my love of the ocean. 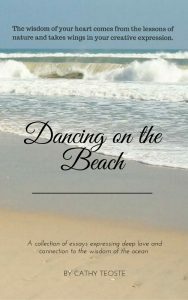 That is how Dancing on the Beach came about. Rewriting my life story was a long emotional process. I would work on it, have a reader or editor look at it, think about the suggestions then finally rewrite. I went through four different versions and formats before I found the format that fit my story. In hindsight, it was the most logical choice but it took me a roundabout way to get there. It is my way I guess, I never seem to approach anything in a linear fashion. I love jumping around here and there to see what side trips might be interesting or what I might see or discover. When I thought about becoming a writer, I never thought about writing personal essay but it is where I found my voice. Writing my own life story wasn’t in the plans either but years ago a teacher had suggested that I write about my experience with dissociation. 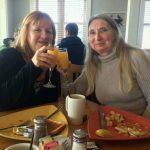 Years later as I was in the midst of my midlife free fall, other women I shared my story with asked me to write and share it when I arrived. Truth is arriving at one point just sends me off to another point on the horizon I see. Life is like that. We are never meant to arrive and stay long term just for a while and then to move forward towards something more. So I have shared my story in hopes it inspires you to free fall or jump into becoming your true self and share it with the world in whatever expression that is for you. Step Deeper into Your Dreams!